Not too long ago, I had a REALLY fortuitous thrifting trip- as I drove home, I realized I had found materials for nine different projects. NINE! Maybe the thrifts were all freshly replenished, or maybe I was wearing a most impressive thinking cap, but either way, it was an adventure for the record books. And this plain kitchen wire shelf/rack was one of my finds. Wood stash…about to get one plank smaller. After using a wire brush to remove the excess paint chips…and pliers to remove tetanus-wielding rusty nails, we created a newspaper template of how large I wanted the “new” backing to be. Then, we divided those measurements in three, measured the plank, and sawed off three equally long pieces. Now I could turn my attention to the little wire shelf / rack! I selected a flat colored metallic paint for its makeover- a color I hadn’t played around with before. Prepped for a modern farmhouse decor makeover! To hang the newly-painted shelves on the salvaged wood backing as farmhouse wall decor, I just needed two small cup hooks…but I only had them in brassy gold (which would NOT do)! So, I painted them with the same paint as the wire shelf. They gotta get painted, too! While the cup hooks dried, I added two D-ring hangers and wire on the back for hanging- nothing fancy and super easy! Once the cup hooks were dry, I inserted them into the wood planks and then hung my little shelf…a shelf which has become modern farmhouse decor storage bins! Isn’t that perfect? Stylish rustic farmhouse decor style bins that will be perfect for my office! I snapped that photo above in my “golden area”, which is where I have the most natural light and the photos look best. But here are my farmhouse decor bins in our newly-renovated office with my brand new computer/writing desk that I am in ABSOLUTE LOVE WITH! Our office is coming together! And no- my desk will never be that orderly again!! But such a fun and inexpensive project that fits right in with our industrial/farmhouse office that is coming together nicely. 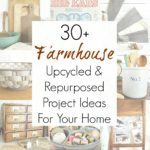 Looking for more DIY modern farmhouse decor inspiration, check out some of my other projects here. And for more repurposed storage and organization project ideas, please check out my entire collection here before you go! Love it! Those planks are the perfect backdrop! I love your princess phone, too. He’s a favorite photo accessory! A thrift store find in Blue Ridge, Georgia! Well, this is a very timely tutorial…I have two wire shelves I’ve used in the past for my craft paint, etc but the white finish on them is snooze worthy. I took them down when I refreshed the laundry room and they’ve been languishing ever since. I haven’t wanted to get rid of them as they are perfect storage pieces – now I know how to give them some pizzazz! Weathered old wood and spray paint! Now why didn’t I think of that? Love how yours look. That is soo cute! Love it on the weathered wood! I think I’ve seen those same type of shelves at the thrifts & just kept right on walking…ha! This would sell in a booth, but I know you’re finding the perfect use for it at home! Great idea! Love it! This would come in so handy. Very clever how you connect the wire basket to the wood with cup hooks, so simple. I will have to remember this for a project I will be starting soon. Very cute, practical, and fairly straightforward! Thank you – looks like something I could tackle! Totally, Cathy- it is definitely straightforward and anyone with a drill can do it, I promise! You always amaze me, this is brilliant! It’s so funny- I was worried that people would have the opposite reaction (like, this project is too basic/simple!) so I appreciate that, Katrin!! Another great idea! You always seem to have an ability to see what something can become! Did you pre-drill the holes on the little horizontal boards? A lot of the time, I found that if I don’t pre drill, the wood splits. Not in this case- just started very slow and steady. But yes, pilot holes are usually the way to go! Smarty pants (as my mom used to call me) this is so cool and it is a copy in the making, I have some shelves, not like yours, but will do, love this. Thank you so very much, Ellen! What a good idea for storage. Love this idea! Change the patina of the metal, and use up some scrap wood! Great idea! Awesome job, Sarah! Love the wood and metal combo for sure 🙂 I’m constantly working on trying to make my office/craft space more efficient. Need to keep an eye out for one of these! Great idea! Thanks for sharing @ Vintage Charm! I can think of about 5 places in my house I need one of these! Great project! Very nice! Love you stack of wood too 😛 Pinned! I’m slowly but surely working through it- thank you so much! I have two of those ugly white racks in my garage and I did not know what to do with them. Thank you for your inspiration!! Your racks are absolutely fantastic!! Okay, my eyes are getting worse and worse, and i know you aren’t supposed to see them, but can you give me a hint as to where the cup hooks are on the “ta-da” photo, please? That’s the secret- they’re hard to see in the final photo, LOL! As you saw in my tutorial, they’re painted to match and blend in perfectly.